Both Qiu Jin and Jiǎng Bīngzhī were born into wealthy and educated families. They both rebelled against the marriages their families arranged for them. 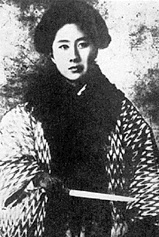 Qiu Jin was a revolutionary and a poet. Jiǎng Bīngzhī was a revolutionary and a novelist. Things changed greatly for women in China over the time these two women lived. Qiu Jin had bound feet and when she was young, many Han Chinese women had bound feet. Qiu Jin underwent the painful process of unbinding her feet as an adult. She married the man her parents chose for her, but she left him to study abroad. She joined a group of revolutionaries who wanted to modernize China. She spoke out for women’s rights and became the principal of a school for girls. In 1907 she was arrested under suspicion of involvement in a rebellion, and executed. For more about Qiu Jin, see Autumn Gem. Jiang Bingzhi’s father died when she was only three, and her mother became a teacher to support the family. Jiang Bingzhi did not have bound feet, and she refused the marriage her uncles arranged for her. She wrote many novels, and for a while was in favor with the new Communist government, but later was exiled for twelve years during the Cultural Revolution. In 1978, the government publicly apologized and she was celebrated again for her work. This entry was posted in Chinese History and tagged women by admin. Bookmark the permalink.